TAG Heuer S.A. (/ˌtæɡ ˈhɔɪ.ər/ TAG HOY-ər) is a Swiss luxury manufacturing company that designs, manufactures and markets watches and fashion accessories, as well as eyewear and mobile phones manufactured under license by other companies and carrying the Tag Heuer brand name. TAG Heuer traces its roots to 1860 when Edouard Heuer founded Uhrenmanufaktur Heuer AG (English: Heuer Watchmaking Inc.) in St-Imier, Switzerland. Edouard Heuer patented his first chronograph in 1882 and in 1887 patented an "oscillating pinion" still used by major watchmakers of mechanical chronographs. Heuer introduced its first wrist chronograph in 1914. The crown was at the 12 o'clock position, as these first wrist chronographs were adapted from pocket chronographs. In 1916 Edward Heuer's son, Charles-Auguste introduced the "Mikrograph", the first stopwatch accurate to 1/100 of a second. This model was soon followed by the "Semikrograph", a stopwatch that offered 1/50 of a second timing, as well as a split-second function (which allows the user to determine the interval between two contestants or events). In 1933, Heuer introduced the "Autavia", a dashboard timer used for automobiles and aviation (whence its name, from "AUTos" and "AVIAtion"). The companion "Hervue" was a clock that could run for eight days without being wound. Over the period from 1935 through the early 1940s, Heuer manufactured chronographs for pilots in the Luftwaffe, known as "Flieger" (pilot) chronographs. The earlier version featured a hinged-back case and one pusher (for start/stop/reset); the later version had a snap-back case and added a second pusher (for time-in and time-out). All these Flieger chronographs had two-registers, with a capacity of 30 minutes." In the mid-1940s, Heuer expanded its line of chronographs to include both two- and three-register models, as well as a three-register chronograph that included a full calendar function (day/date/month). As the highest development of Heuer's chronographs, these "triple calendar" chronographs were offered in stainless steel, 14 karat gold and 18K and 22K gold cases. Dial colors were white, black or copper. In the early-1950s, Heuer produced watches for the American retailer Abercrombie & Fitch. The "Seafarer" and "Auto-Graph" were chronographs produced by Heuer to be sold by Abercrombie & Fitch. The "Seafarers" had special dials—with blue, green and yellow patterns—that showed the high and low tides. This dial could also be used to track the phases of the moon. Heuer produced a version of the "Seafarer" for sale under the Heuer name, with this model called the "Mareographe". The "Auto-Graph" was produced in 1953 and 1954, and featured a tachymeter scale on the dial and a hand that could be preset to a specific point on the scale. This allowed a rally driver or navigator to determine whether the car was achieving the desired pace, over a measured mile. Advertisements and literature also pointed out that this hand could be rotated to count golf scores or other events. From 1911, Heuer manufactured timepieces to be mounted on the dashboards of automobiles, aircraft, and boats. These clocks and timers included a variety of models, designed to address specific needs of racers and rallyists. In 1958, Heuer introduced a new line of dashboard timepieces, which included the Master Time (8-day clock), the Monte Carlo (12-hour stopwatch), the Super Autavia (full chronograph), Sebring (60-minute, split-second timer), and Auto-Rallye (60-minute stopwatch). Heuer continued to manufacture these dashboard timepieces into the 1980s, at which time they were discontinued. Heuer also introduced timing devices for ski and motor racing events, including Formula One. From the 1950s to the 1970s, Heuers were popular watches among automobile racers, both professionals and amateurs. Heuer was a leading producer of stopwatches and timing equipment, based on the volume of its sales, so it was only natural that racers, their crews and event sponsors began to wear Heuer chronographs. Special versions of Heuer chronographs were produced with logos of the Indianapolis Motor Speedway, as well as the names or logos of racing teams or sponsors (for example, Shelby Cobra, MG and Champion Sparkplugs). In 1962, Heuer became the first Swiss watchmaker in space. John Glenn wore a Heuer stopwatch when he piloted the Mercury Atlas 6 spacecraft on the first US manned space flight to orbit the earth. This stopwatch was the back-up clock for the mission and was started manually by Glenn 20 seconds into the flight. It is currently on display at the San Diego Air and Space Museum. The Autavia chronograph was introduced in 1962 and featured a rotating bezel, marked in either hours, minutes, decimal minutes (1/100th minute increments), or with a tachymeter scale. All manual-wind Autavias from the 1960s had a black dial, with white registers. Early cases had a screw-back and later models (from and after 1968) had snap-backs. The "Autavia" name had previously been used on Heuer's dashboard timers (described above). 1963 The Carrera chronograph was introduced, designed by Jack Heuer, great grandson of Edouard. The Carrera had a very simple design, with only the registers and applied markers on the dial. The fixed inner bezel is divided into 1/5 second increments. The 1960s Carreras were available with a variety of dials, including all-white, all-black, white registers on a black dial, and black registers on a black dial. A three-register, triple calendar version of the Carrera was introduced around 1968. Most of Heuer chronographs from this period—including the Autavias and Carreras—used movements manufactured by Valjoux, including the Valjoux 72 movement (for a 12-hour chronograph) and the Valjoux 92 movement (for a 30-minute or 45-minute chronograph). The Valjoux 72 movement utilized a "tri-compax" design, with three registers on the dial—one register for the chronograph hours (at the bottom), one register for the chronograph minutes (at the right), and a third register for a continuously running second hand (at the left). The second hand for the chronograph was mounted on the center pinion, along with the time-of-day hands. Heuer acquired the "Leonidas" brand in the early-1960s, with the combined company marketing watches under the "Heuer-Leonidas" name. One of the designs that Heuer acquired from Leonidas was the "Bundeswehr" chronograph, used by the German air force. These "BWs" feature a "fly-back" mechanism, so that when the chronograph is reset to zero, it immediately begins running again, to time the next segment or event. In the mid-1960s, Heuer partnered with Breitling and Hamilton (and in competition with Seiko and Zenith) to introduce an automatic chronograph. These projects were conducted in secret, as none of the competitors wanted the other companies to be aware of their efforts. Heuer-Breitling-Hamilton held press conferences in Geneva and New York, on 3 March 1969 to show their new lines of chronographs. The Heuer Monaco 40th Anniversary re-edition with Calibre 11 (2009) is a limited-edition, contemporary replica of the original 1969 Heuer Monaco. Heuer's first automatic chronographs were the Autavia, Carrera, and Monaco. These were powered by the Cal 11 and Cal 12 movements (12-hour chronograph); Cal 14 movement (12-hour chronograph and additional hand for GMT/second time-zone) and the Cal 15 movement (30-minute chronograph). The winding crown was on the left, with the pushers for the chronograph on the right. The earliest of Heuer's Cal 11 chronographs (from 1969) were named "Chrono-Matic". In the early-1970s, Heuer expanded its line of automatic chronographs to include the Daytona, Montreal, Silverstone, Calculator, Monza, and Jarama models, all powered by the Calibre 11 movement. In 1975, Heuer introduced the Chronosplit, a digital chronograph with dual LED and LCD displays. Later versions featured two LCD displays. Heuer began using the Valjoux 7750 movement in its automatic chronographs, with the Kentucky and Pasadena models (both introduced in 1977). The Valjoux 7750 movement was a three-register chronograph (with seconds, minutes, and hours), that also offered day/date windows. In the mid-1970s, Heuer introduced a series of chronographs powered by the Lemania 5100 movement. The Lemania 5100 movements have the minute hand for the chronograph on the center pinion (rather than on a smaller register), greatly improving legibility. The Lemania 5100 movement is considered very rugged and has been used in a variety of chronographs issued to military pilots. There are ten models of Heuer chronographs powered by the Lemania 5100—Reference 510.500 (stainless steel), 510.501 (black coated), 510.502 (olive drab coated), 510.503 (pewter-coated), 510.511 (Carrera dialed acrylic crystal PVD finish), 510.523 (Carrera dialed acrylic crystal stainless steel), as well as models with the names Silverstone (steel case with black dial) and Cortina (steel case with blue dial); the Reference 510.543 was made for the A.M.I. (Italian Air Force) and a special edition (with no reference number marked on the case) was made for AudiSport. TAG Heuer formed in 1985 when TAG (Techniques d'Avant Garde), manufacturers of high-tech items such as ceramic turbochargers for Formula One cars, and British businessman Ron Dennis, acquired Heuer. In 1999 TAG Heuer accepted a bid from LVMH Moët Hennessy Louis Vuitton S.A. of SwFr1.15 billion (£452.15 million) (US$739 million), contingent upon a transfer of 50.1 percent of stock. In 2010, TAG Heuer introduced the "Pendulum Concept", the first magnetic oscillator without hairspring capable of providing restoring torque comparable to that of hairspring. In 2013, TAG Heuer celebrated the 50th anniversary of the Carrera, the racing-inspired chronograph that is a key part of the TAG Heuer range today. There have been ten generations of Carrera since its introduction, with models launched in every decade since 1963. In 2017 TAG Heuer released limited edition Muhammad Ali watch. A company slogan of TAG Heuer is "Don't Crack Under Pressure". The slogan was originally introduced in 1991. TAG Heuer's current lines include Formula One, Aquaracer, Link, Carrera, Monaco, Connected, and Grand Carrera. Some of the more recently[when?] announced models include the Monaco V4 (the movement of which is driven by belts rather than gears); the Carrera Calibre 360 (the first mechanical wrist chronograph to measure and display time to 1/100 of a second) and the Monaco 69 (with both a digital chronograph accurate to a millisecond and a traditional mechanical movement, with a hinged mechanism allowing wearers to flip the watch between its two separate dials). London-based Christoph Behling has been the lead designer for TAG Heuer since 2004. The collaboration has resulted in some of the brand's most celebrated pieces including the world's fastest chronograph, the Mikrogirder 1/2000th, launched in 2012. Many TAG Heuer watches feature chronographs. In January 2011 TAG Heuer announced the new Carrera Mikrograph, the first TAG Heuer to use the in-house Mikrograph movement, which is accurate to 1/100 of a second. Additionally, TAG Heuer has also released the limited edition Carrera MP4-12C to commemorate the launch of the McLaren MP4-12C supercar. TAG Heuer has been a partner of the McLaren F1 team for over 26 years. At the Basel 2011 show in March 2011, TAG Heuer announced the Mikrotimer Flying 1000, a concept mechanical watch capable of accuracy of 1/1000 of a second—ten times faster than the Mikrograph. This mark was superseded in January 2012 with the Mikrogirder model, precise to 5/10,000ths of a second. Morez, France-based Groupe Logo manufactures TAG Heuer-branded eyewear under a licence acquired in 2002. Paris, France-based ModeLabs Group manufactures TAG Heuer-branded mobile phone under licence. ModeLabs acquired the license in late-2007 and marketed the first TAG Heuer branded mobile phone in late 2008. The company also markets a line of men's accessories including wallets, belts, bags, jackets, bracelets, and cuff-links. In 2007, TAG Heuer won the iF product design award for its Monaco Calibre 360 LS Concept Chronograph. The award was given away by the International Forum Design Hannover GmbH, held in Hanover, Germany. The watch received the award in the Leisure/Lifestyle category. It was chosen among more than 2,200 timepieces presented by watchmakers from 35 countries. TAG Heuer received the iF product design award for the second time in two years. In 2006, another TAG Heuer watch, entitled Professional Golf Watch, won in the same Leisure/Lifestyle category. The design of the Professional Golf Watch was developed with Tiger Woods. In 2010 the Carrera 1887 won La Petite Aiguille ("the small hand") award for watches retailing for less than CHF5,000 at the Grand Prix d'Horlogerie de Genève. In December 2018, World Wide Fund for Nature (WWF) released an official report giving environmental ratings for 15 major watch manufacturers and jewelers in Switzerland. TAG Heuer, along with Chopard, was given a below-average environmental rating as "Lower Midfield", suggesting that the manufacturer has only taken a few actions addressing the impact of its manufacturing activities on the environment and climate change. TAG Heuer, in keeping with its image as a luxury brand with an innovative spirit, has long-standing links with the world of sport and Hollywood. The brand has had a long list of sports and Hollywood ambassadors. In addition, TAG Heuer has paid numerous celebrities to endorse its products, including: Tom Brady, Ayrton Senna, Kevin Richardson, Cristiano Ronaldo, Chris Hemsworth, Jessica Michibata, Tiger Woods, Leonardo DiCaprio, Brad Pitt, Jack Ruvio, Sarah Fisher, Louis Koo, Chen Daoming, G.E.M. Tang, Jeff Gordon, Maria Sharapova, Jeremy Lin, Juan Pablo Montoya, Kimi Räikkönen, Uma Thurman, Fernando Alonso, Lewis Hamilton, Therese Johaug, Shah Rukh Khan, Priyanka Chopra, Cameron Diaz, Steve McQueen, Ranbir Kapoor, Mary Kom, Alexander Rossi and Li Yifeng. Steve McQueen wore a blue Monaco in the 1971 movie Le Mans (this model is now referred to as the "McQueen Monaco"), and Swiss Formula One star Jo Siffert customarily wore a white-dialed Autavia with black registers. In 1974, Heuer produced a special version of the black-dialed Autavia that was offered by the Viceroy cigarette company for US$88. This version of the Autavia was called the "Viceroy" and advertisements for this promotion featured racer Parnelli Jones. TAG Heuer has been the official timekeeper of the three Summer Olympic Games of the 1920s, the Skiing World Championships, the Formula One World Championships and has developed a watch for the McLaren F1 team. Heuer was the official timepiece of the Ferrari F1 team in the 1970s and McLaren from the 1980s until 2015. TAG Heuer is the official time keeper and sponsor of La Liga, Premier League, Bundesliga, Ligue 1, Serie A, J1 League, and Major League Soccer. TAG, now known as TAG Group which is no longer affiliated with TAG Heuer, sponsored Formula One team Williams during the early 1980s. TAG also gave its name to the Porsche engines used by the McLaren Formula One team from 1983 through 1987. TAG Group continues to hold a stake in McLaren. From 2016 to 2018, TAG Heuer formed a partnership with the Red Bull Racing Formula One team. The partnership included Red Bull running TAG Heuer-branded power units supplied by Renault. In June 2018 Red Bull announced an agreement with Honda as their engine supplier for the 2019 and 2020 seasons, ending their partnerships with Renault and TAG Heuer. The endorsement with Red Bull was part of a larger promotional outreach program by TAG Heuer CEO Jean-Claude Biver to entry into markets that may not necessarily be traditional markets for the company, an idea Biver calls "Universes", which include sport, heritage, lifestyle and art and music. Other brand ambassadors in the "Universes" program include David Guetta, OneRepublic, Martin Garrix, Cara Delevingne, Chris Hemsworth, Alec Monopoly, Manchester United F.C. and Muhammad Ali. Starting in May 2018 TAG Heuer picked up the title sponsorship of the pagoda at the Indianapolis Motor Speedway. † The driver did not finish the Grand Prix, but was classified as he completed over 90% of the race distance. ^ a b "Company Profile, Information, Business Description, History, Background Information on TAG Heuer S.A." referenceforbusiness.com. Advameg Inc. Retrieved 4 December 2015. ^ "Virtual Reality Takes Fans Inside the World of Watches". nytimes.com. Retrieved 17 November 2018. 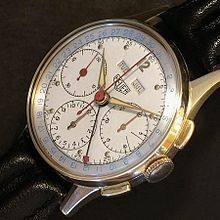 ^ The First Ever Swiss Timepiece in Space Archived 9 November 2006 at the Wayback Machine, tagheuer.com, retrieved on 1 February 2007. ^ "Heuer/TAG-Heuer & Tourneau Lemania 5100 & Valjoux 7750 Chronographs". Chronomaddox.com. Retrieved 27 September 2012. ^ CNNfn staff, TAG accepts LVMH bid, CNNMoney, 13 September 1999, Retrieved on 26 February 2007. ^ "Week's Party Pictures 13 October 2017". ikonlondonmagazine.com. Retrieved 17 January 2018. ^ Heuer, T. A. G. (8 May 2018). "TAG Heuer "Don't Crack Under Pressure" campaign with Cara Delevingne, shot by David Yarrow". TAG Heuer. Retrieved 23 January 2019. ^ a b "TAG Heuer: Don't Crack Under Pressure | The Home of TAG Heuer Collectors". www.calibre11.com. Retrieved 23 January 2019. ^ Geneva Watchmaking Grand Prix 2006: TAG Heuer triumphs again! Archived 1 November 2007 at the Wayback Machine, TAGHeuer.com, retrieved on 12 January 2008. ^ Concept Watches Archived 27 February 2007 at the Wayback Machine, TAGHeuer.com, Retrieved on 26 February 2007. ^ Australia (19 January 2011). "TAG Heuer Carrera Mikrograph Review | TAG Heuer Watch Reviews". Calibre11.com. Retrieved 27 September 2012. ^ Australia (29 January 2011). "TAG Heuer Carrera MP4-12C- Review | TAG Heuer Watch Reviews". Calibre11.com. Retrieved 27 September 2012. ^ Australia (24 March 2011). "TAG Heuer Mikrotimer Flying 1000- First Look | TAG Heuer Watch Reviews". Calibre11.com. Retrieved 27 September 2012. ^ Australia (27 January 2012). "TAG Heuer Mikrogirder: The Inside Story | TAG Heuer Watch Reviews". Calibre11.com. Retrieved 27 September 2012. ^ "History – Logo Group, Innovative manufacturer since 1896". Groupelogo.com. Archived from the original on 29 November 2014. Retrieved 27 September 2012. ^ "Exclusive agreement: ModeLabs and Tag Heuer in mobile communications". Journal Haute Horlogerie. Archived from the original on 14 April 2013. Retrieved 27 September 2012. ^ "PROFESSIONAL WATCHES: TAG Heuer Monaco 360 LS iF Design Award". professionalwatches.com. Archived from the original on 13 March 2008. Retrieved 17 January 2018. ^ Australia (19 November 2010). "TAG Heuer Carrera 1887 Wins Grand Prix de Geneva Award | TAG Heuer Watch Reviews". Calibre11.com. Retrieved 27 September 2012. ^ a b c d "Environmental rating and industry report 2018" (PDF). World Wide Fund for Nature. Retrieved 19 January 2019. ^ a b swissinfo.ch, S. W. I.; Corporation, a branch of the Swiss Broadcasting. "Swiss luxury watches fail to meet environmental standards". SWI swissinfo.ch. Retrieved 19 January 2019. ^ Vidal, John; Guest, graphic by Pete (15 August 2015). 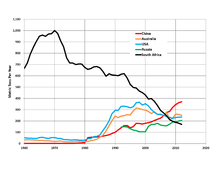 "How developing countries are paying a high price for the global mineral boom". The Observer. ISSN 0029-7712. Retrieved 2 February 2019. ^ "China needs to get to grips with its gold mining pollution crisis". www.chinadialogue.net. Retrieved 2 February 2019. ^ Einhorn, Dom (9 February 2015). "Mining in Russia: An economic boost or an environmental threat?". Born2Invest. Retrieved 2 February 2019. ^ "South Africa has failed to protect locals from gold mine pollution: Harvard report". MINING.com. 12 October 2016. Retrieved 2 February 2019. ^ Stars and Glamour Archived 14 March 2009 at the Wayback Machine, tagheuer.com, retrieved on 12 March 2009. ^ "Luxury Swiss Watches for men and women - TAG Heuer". Archived from the original on 10 January 2012. ^ "Celebrities and the watch brands that they endorse". ^ "ADS with celebrities for TAG Heuer Watches". ^ Gisbert. L. Brunner: Späte Genugtuung für grossen Pionier. In: Handelszeitung No. 47/2017, Uhren + Schmuck, page 11. ^ Australia (27 January 2010). "The TAG Heuer McLaren Watches | TAG Heuer Watch Reviews". Calibre11.com. Retrieved 27 September 2012. ^ Li, Alice (5 September 2017). "Tag heuer special watches with the Ferrari F1 team and McLaren". Blog for Tagheuer, Hublot, Cartier, Audemars PIGUET replica watch review. Archived from the original on 5 September 2017. Retrieved 5 September 2017. ^ "TAG Heuer Signs the Red Bull Racing Formula 1 Team". tagheuer.com. TAG Heuer. 4 December 2015. Archived from the original on 23 March 2016. ^ Barretto, Lawrence (4 December 2015). "Red Bull announces it will have TAG Heuer-branded F1 engine in 2016". autosport.com. Haymarket Publications. Archived from the original on 4 December 2015. Retrieved 4 December 2015. ^ "Red Bull and Honda agree two-year engine deal". formula1.com. Retrieved 25 November 2018. ^ Doerr, Elizabeth (13 December 2016). "Alec Monopoly Joins The TAG Heuer Universe: A (Street) Artist In Swiss Residence". Quill & Pad. Archived from the original on 3 January 2017. Retrieved 3 January 2017. ^ "Red Bull – Grands Prix started". StatsF1. Retrieved 29 July 2018. Wikimedia Commons has media related to TAG Heuer.